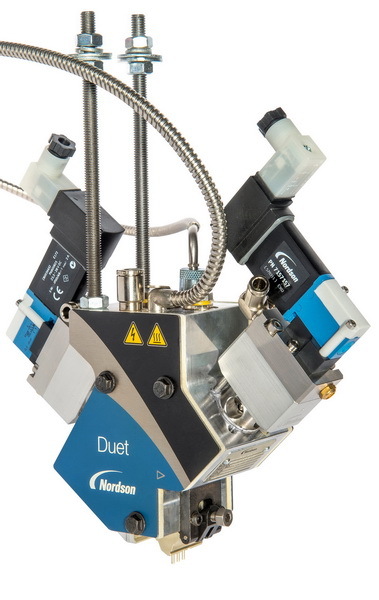 Nordson Corporation just released the Duet™ variable dispense applicators to help improve product quality and performance of nonwoven disposable hygiene products. The patented, dual-module applicators deliver different add-on weights at the ends of an elastic strand than in the middle. This variable add-on produces the high bond strengths needed to secure the ends of elastic to a nonwoven garment while helping retain retractive forces in the center of the elastic strand. 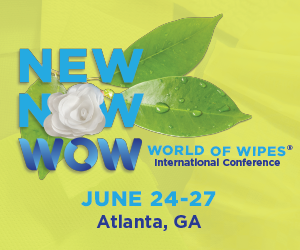 Applications that can benefit from this capability include elasticized legs, leg cuffs and waistbands on disposable nonwovens infant diapers, training pants and adult incontinence products. Duet applicators provide complete adhesive coverage of the entire strand in a single pass using two independently-fed, independently-cycling Speed-Coat® modules to optimize adhesive use and deliver excellent cutoff. The lighter add-on weight in the center of the elastic strand provides a stabilizing bond while supporting high-performance elastic features. Meanwhile, heavier add-on weights at the ends of the elastic securely bond the elastic strand to the product to provide durability in use. Compatibility with Nordson’s Allegro® and SureWrap® elastic attachment nozzles further improves product quality and optimizes adhesive use. These nozzles use the patented Nordson Universal™ clamping feature for quick, easy nozzle changes to maximize machine up-time and the patented integral strand guide to stabilize the elastic at the point of application for reliable elastic coating. Increased production efficiency and simplified maintenance are further supported by quick-change heaters, sensors, filters and modules. And, Duet applicators’ narrow profile and small footprint facilitate installation in tight spaces. Please view the Duet animation on Nordson’s YouTube channel to fully understand the benefits this unique design can deliver to elastic attachment applications. For more information about Duet variable dispense applicators or any of the Nordson solutions for disposable hygiene product manufacturing, contact Nordson Corporation at (800) 683-2314 or visit www.nordson.com/nonwovens.